We stayed here for a few nights in late June and really enjoyed our stay. The house was sunny and clean. It had everything we needed and more than enough space for two people. We loved the ocean views from the balcony and welcomed the sea breezes through open doors and windows. The location couldn't be beat -- being less than a block from the ocean, surrounded by scenic coastal trails, within walking distance to great restaurants, and a short drive to Monterey, Carmel, and the Pacific Coast Highway. I would stay here again. Dive, kayak, or stand-up paddle in the deep blue waters of Monterey Bay. 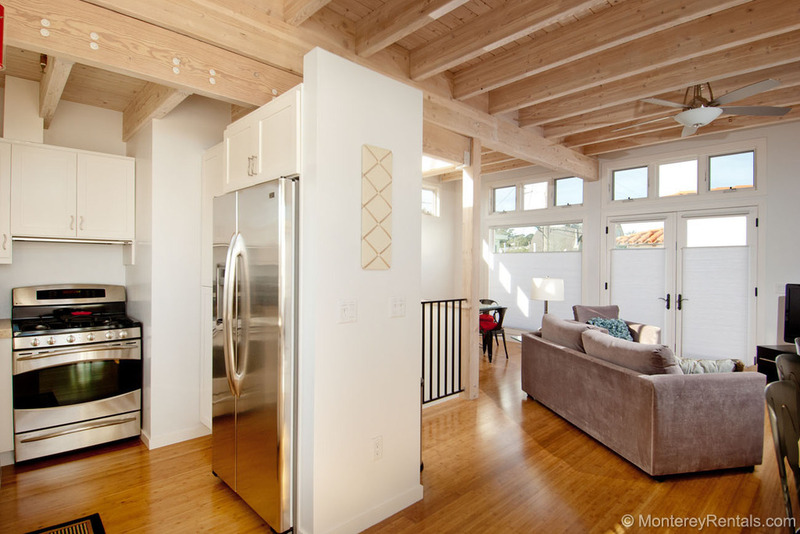 Hike, bike, or stroll along the coastal trail… and then retreat to this contemporary beachouse. Two bedrooms downstairs (one has a Queen bed, the other has two Twins) share a full bath with a gorgeous etched glass countertop and double vessel sinks. A spiral staircase leads to the second floor living area, with a fireplace, a flat screen TV, and a second full bath. High clerestory windows frame blue skies above the modern galley kitchen, with stainless appliances and travertine countertops. And then there's the upper patio: with views of the Bay, this is where you'll toast the end of a perfect day, accompanied by the mesmerizing sounds of the surf. Living areas and patio are upstairs, along with a full bath. Lover's Point and all the charms of Pacific Grove are at your doorstop. The Aquarium and Cannery Row are close by. The coastal path and weekly Farmer's Market downtown. We spent a few days here with our adult kids. The space was perfect for our family. It was clean and well appointed. The location was fabulous! Walk across the street and you have amazing waves crashing ashore and seals playing in them. We took walks every day. Drive to the peninsula and see the sunset on a clear evening. Close to Carmel, Big Sur and Point Lobos too. Had a ball! The house was great and wonderful location. I was stay again. Thanks for an enjoyable vacation. Amazing property - location, decor, everything! The Mermaid property was magical. The décor was so adorable, very beachy and relaxing. The view of the ocean was awesome; even better was the short walk to the ocean and the nature trail. Spent the mornings watching sea lions and otters while drinking my coffee. Proximity to the aquarium and Cannery Row was great as well. I'd highly recommend this property! The unit was absolutely beautiful and in a terrific location. The unit was updated with modern amenities, fun beachy art, glass bowl sinks in the bathrooms, and a gas fireplace which made it very cozy on foggy mornings . The beds were very comfortable. It was one block from the beach and a 5 minute walk to Lovers Point and the Beach House restaurant. The check in and out process was extremely easy. We would definitely go back and are recommending it to all our friends. Thank you for a wonderful stay. Wonderful place! Great location and very clean! Would stay there again! This property is everything you dream of when it comes to a home away from home. It was spotless, bright and just steps away from the water and the Monterey Bay Coastal Trail. I highly recommend this home for your next stay, it will not disappoint! This house is beautifully constructed with lovely amenities. It is wonderfully located across street from ocean with two partial views (another house in front of it). Bathrooms are gorgeous, very clean, bright, and colorful. Attention to detail was obviously taken when it came to small things like fixtures. Nice appliance with large refrigerator. Great spot for a romantic getaway in a very quiet neighborhood. Spiral staircase is nicely placed and adds a certain elegance to the house. I would advise future tenants to be strong, active, and healthy as the bedrooms are downstairs and living accommodation upstairs. A small car will be best for this location as I drove a SUV and was challenged when it came to parking. The one car garage is not equipped for anything bigger than a mid-size vehicle. Rating this house 4 stars out of 5 because master bed is only a queen size and the mattress was kind of hard. Making it a king size with softer mattress (room has the space) would make all the difference. Also, it was unfortunate that when we arrived, we were was unable to access house due to the city paving the only road to get there (one way street). We were not made aware of this prior to arrival. We had to wait and additional hour before we could enjoy the rental. We purposely arrived early so we could enjoy location from beginning to end. Also, on our departure date, the water was turned off and we did not have water to take showers. We understand that the city has work to do everywhere but it would be great for tenants to know so they can adjust. No fun driving 2.5 hours home to take shower when we paid for such a beautiful rental. Bottom line, please be aware of activities such as these that will have huge impact on tenants stay and opinion. The Mermaid is still a beautiful house. Thank you for your lovely review of Mermaid. We deeply apologize for the inconveniences you suffered during your stay - please contact us to discuss how we can best compensate you. Unfortunately we did not receive advance notice from the City about the paving project, so we were unable to warn you about the road closure and service interruption. If we had known we would have offered to move you to another property - a vacation without water is no vacation! As far as the bedding situation, there is space for a King, but the owner feels that a larger bed would overwhelm the space. And as for firmness, we’re in a bit of a Goldilocks situation: what one guest considers “too firm” another calls “too soft” and a third thinks is "just right.” Our 24 hour maintenance staff would have been happy to deliver a mattress topper if they had been called - our guest’s comfort is our first priority. We visited the weekend of August 25th 2017 and stayed two nights. The location was great for quick access to the ocean and walking trail. We walked into town Saturday and had a great time. The house is clean, modern and a great value. There are partial ocean views from the patio area and the kitchen. We stopped at the Mermaid on our way back from the World Dog Surfing Championships in Pacifica and could not have been more pleased! The house is lovely, a few steps from the Monterrey trail and walkable to Cannery Row! A short trip to Carmel for a red carpet event! The house has everything you could need and is comfortable, clean and very homey! We loved our stay! Very clean and nice property less than a block from the ocean and away from any busy traffic. Balcony was lovely, lighting in the home was gorgeous. Perfect size for a couple or a family of 4. We stayed with our pet and he loved it too! We were able to go right out to the walking trail along the ocean every morning for a jog. You are only about a mile walk to Canery Row area which was nice. Overall pleased and would stay again. Great house with excellent location! The best part about this rental is the upstairs which is a large open space with a kitchen, living room and dining room with an outdoor porch. Also on the 2nd floor is a very bright and airy full bathroom. The 1st floor master bedroom is a little dark but the bathroom downstairs is very nice with 2 sinks and a shower. The 2nd bedroom has 2 twin beds and is also connected to the bathroom - very nice set up.The pictures are a bit misleading. The house is in an alley and the view of the bay is obstructed by another rental that actually has a full view. The unit does need a little more attention paid to the details. The kitchen lacks a full set of cookware, there were cobwebs on the windows both inside and outside and the red trim paint around the doors comes off when you touch it. There is very little landscaping and the touch-up painting inside is obvious. One of the hinges on ottoman in the living room is broken and another living room cushioned chair would be nice. For the price of this rental the little details should be taken care of but the upstairs living space really is a treat. Thank you for pointing out those details! Cobwebs have been cleaned, cookware has been supplemented, and the ottoman has been repaired. Fantastic house, one block back from beach, modern and comfortable layout, great walking and not to far to Monterey, really enjoyed our stay. Wonderful week on Mermaid Lane! We loved our 4 days at Mermaid. The house was perfect for our Thanksgiving holiday. It was clean, well appointed, and just a half block to the beach. The spiral staircase was interesting, a challenge at first. Awesome place with an even more amzaing location! Stayed at Mermaid for nearly 30 days during my move to Monterey. Could not have been happier with the place. If you love sun, there is plenty that comes into this residence. Was even able to bring the dog (wish cats could too given no carpet in the house). I would have to say the heated bathroom floors and few hundred feet from the activity trail/ocean top my list!